Miniature Maven Diaries: It's so hard to resist! 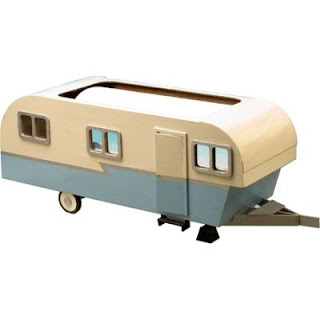 Isn't this camper the cutest thing? Many of you probably recognize it as the $25 kit from Greenleaf. Our local Miniaturists' Club Show and Sale is coming up on September 16th and I'm sure they'll be selling it there. But I have to buy strategically at the show and sale! I've decided to spend my money mostly on accessories, ones that are hard to find, like those tiny glass jars you use to make itsy bitsy jars of jam. I think my miniature coke and seven up bottles would look great in front of this Camper. I'd love to do this someday. It would be fairly quick and my family did a lot of camping growing up. Another good thing to spend money on is supplies, that has always been where I seem to spend my money. I love coming home from a show with a ton of ideas of what I want to make and a few supplies like the jars you mention. That camper really looks like fun too. Have you ever been to the Miniatures store Ross' Miniature Treasure House in North Van Jean? This is their website: http://www.rossminiatures.com/ but the website does not begin to show the amount of stock they have. I was in their briefly this past July and picked up a few items for my Nursery Scene. They sell the Camper kit there. It's worth taking a look on Etsy for miniature accessories, Sandie! The shipping costs are quite low. Often when you're ordering from a particular shop they will lower shiping if you buy more than one item from them. Happy shopping!